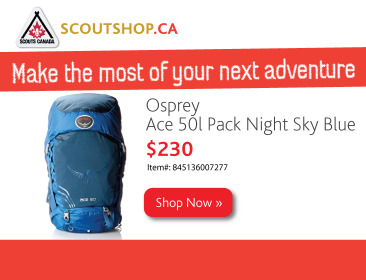 The Osprey Ace 50 is a kid’s backpack designed for overnight lightweight camping. The pack can hold up to 50 litres of volume and weighs 3 pounds. Located on its exterior are two pouches on either side of the bag to hold bottles, a main compartment, as well as a smaller compartment to access the bottom of the bag. A convenient feature of the backpack is the adjustable waist strap which allows the weight of the pack to be shifted from the shoulders to the hips. Not only does this relieve tension on the shoulders and neck, but it also generates added comfort and stability when hiking. One of the best aspects of the pack is its storage capacity. The main compartment can be opened into one large area, or the cloth can be zippered to separate the pack into two smaller sections. This was one of my favourite features as I used the smaller area at the bottom of the pack to store my sleeping bag which kept it separate from the rest of my gear. Emptying my pack was an effortless task as my sleeping bag was easily accessible and my clothing was organized in the other compartment. The base of the pack contains an attached rain cover crafted to seamlessly fit over the exposed areas of the pack. The bright green colour of the rain cover ensures that the pack is visible and can be easily spotted while keeping the contents of the backpack dry. The mesh panel on the front of the pack is useful for quickly packing and obtaining items such as a rain jacket (for the unpredictable weather) or snacks. 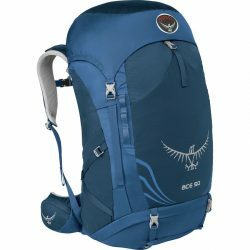 Overall, the Osprey Ace 50 is a stylish, functional pack with the ideal amount of storage space, and its various compartments are beneficial for increased organization.